Coaching and athletics always included “philosophical” ideals. Avoiding pushing an athlete passed a functional or usable point before they’re ready is one I subscribe to. One of the MOST important long term skills in competitive swimming is the STREAMLINE or body line AFTER the turn. This means the streamlined pushoff is FAR more important to have, than a fast turn. While eventually, we want the swimmers to have both, one is much simpler to perform than the other. A great flip turn is a very simple process, but there are a few things that are required to do it properly. First, we have to take into consideration that we don’t want to teach a swimmer something they’re going to have to UNLEARN. One of the toughest things about a great flip turn is understanding that the hands only serve a very small purpose, and their real purpose is to get the body ready to leave the wall again… in streamline. If the hands are required upon too much, in the early development of the turn, then UNLEARNING that is difficult. A great flip turn requires a bit of speed or momentum, combined with the exact timing of lowering the head into the still water to the point that the water pushing the head and torso down into the flip, without any other action taking place. Once the hands interrupt that flow, instinct is built that later, inhibits the flow and the action of working with the water to help the body get around and over more quickly. The youngest and oldest swimmers, unfortunately, sometimes don’t generate the proper velocity to get the water to work with them, so we see many variations of flailing arms, twisted legs, and certainly not pretty, flowing turns that we want. 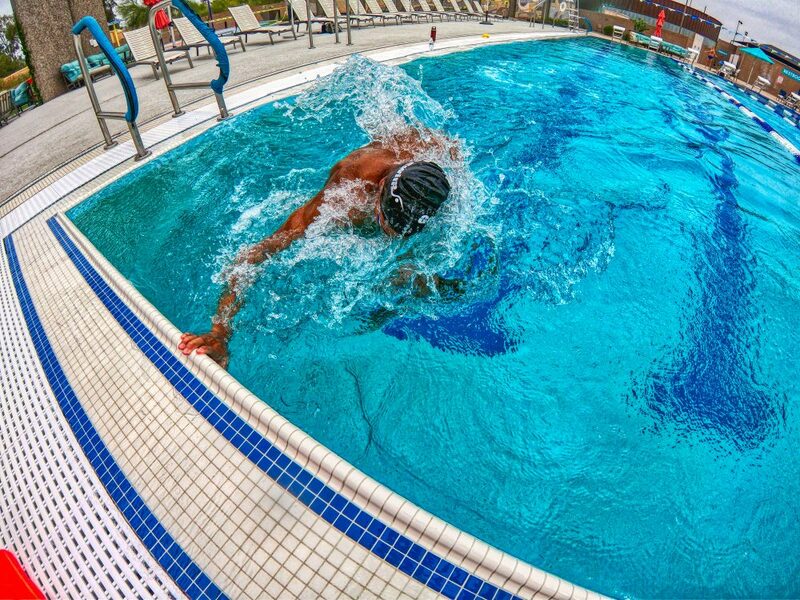 When done properly (which we’re always working toward), an open turn will allow the swimmer to leave the wall nearly as fast as a good flip turn, more than likely faster than a poor flip turn, with the added advantage of getting the swimmers to understand the MOST important part of ANY turn… is how you leave the wall in streamline. Don’t be convinced that the flip turn is the ultimate skill. How you leave the wall can lead to greater velocity overall in the length, which, ultimately, may lead to better flip turns.